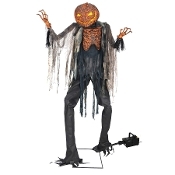 This terrifying Scarecrow prop stands at an imposing 7-feet tall at the top of his gnarled stem and features a flickering light-up Jack O' Lantern pumpkin head and chest that both turn side to side. An excellent animated prop to add to your indoor Halloween decorations! Activation options: steady-on, Step-Here pad, and infra-red sensor. Standard UL power adapter. Easy assembly required. *Fog liquid NOT included. Approx Fixed height 86-inch (215cm) H x 36-inch (90cm) W x 38-inch (95cm) D, animation right to left 48-inch (120cm).